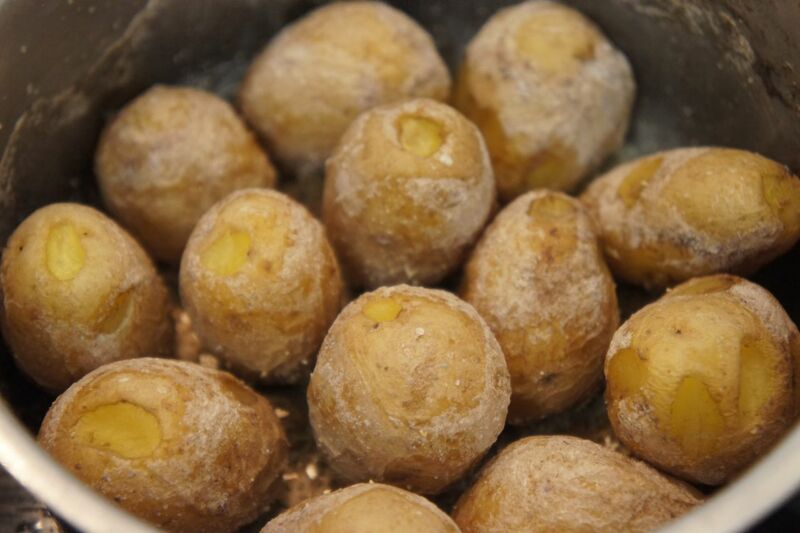 Initially I felt a little foolish when I found out how papas arrugadas are made – they’re simply boiled in heavily salted water (originally sea water, apparently). Easy, right? I couldn’t believe I’d never thought of making potatoes that way before. However, having actually managed to screw them up a few times, I’ve discovered a few techniques for making them properly. I’ve also developed a low-FODMAP sauce that loosely approximates mojo, the garlicky sauce normally served with papas arrugadas. Mojo deserves a few more words of explanation. In the Canary Islands, there are two types of mojo: red (spicy) mojo and green mojo. There are plenty of different recipes but generally the red one (mojo picante) is made is made with chillies and/or red pepper and plenty of garlic, while the green one (mojo verde) is made with coriander and again, plenty of garlic. Some cooks add stale bread or breadcrumbs, so be careful if you’re thinking about having what looks like it should be a gluten-free dish in the Canaries! The version I’ve developed is very quick and simple, which is important when you have small children. It actually combines the best of both the green and red mojos, the coriander and the red pepper, though this innovation of mine isn’t anything I ever encountered in the Canaries. Beyond these main ingredients, I keep the flavourings on the light side to let the red pepper and coriander shine through. This dish can be served as tapas, as appetizer, or as a side – we particularly like it with pollo al salmorejo, also a Canarian dish. Wash the potatoes and remove major blemishes but do not peel. Put in a pot and add just enough water to cover. Add enough sea salt to turn the water into something that tastes like seawater. Boil the pot on high or medium-high until very nearly all the water evaporates. If you find a greyish foam developing, remove as much of it as possible. When you just start to hear the pot crackle, turn down the heat to low so the salt left at the bottom doesn’t burn and the potato skins don’t stick to the bottom. Shake the pot so as to mix the potatoes around and so that the remaining water gets a better chance to evaporate entirely. 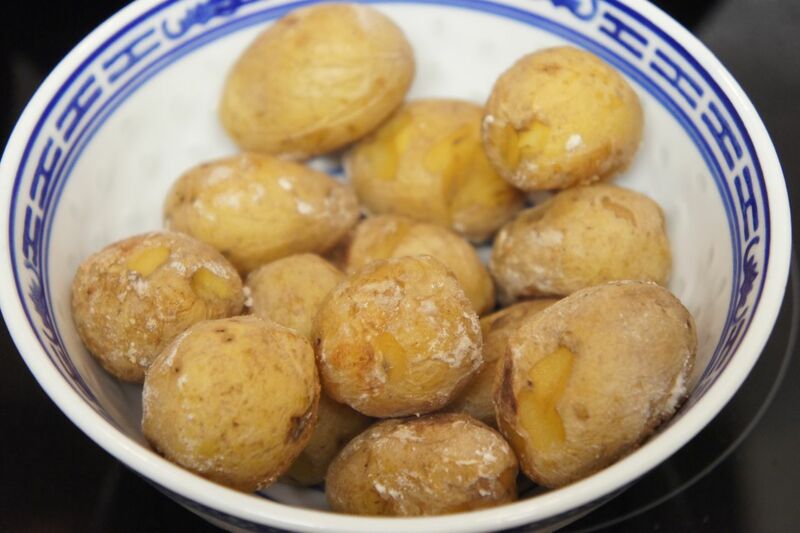 The idea is to get the potatoes to the point where they have a light and even salt crust. If necessary, brush off excess salt. 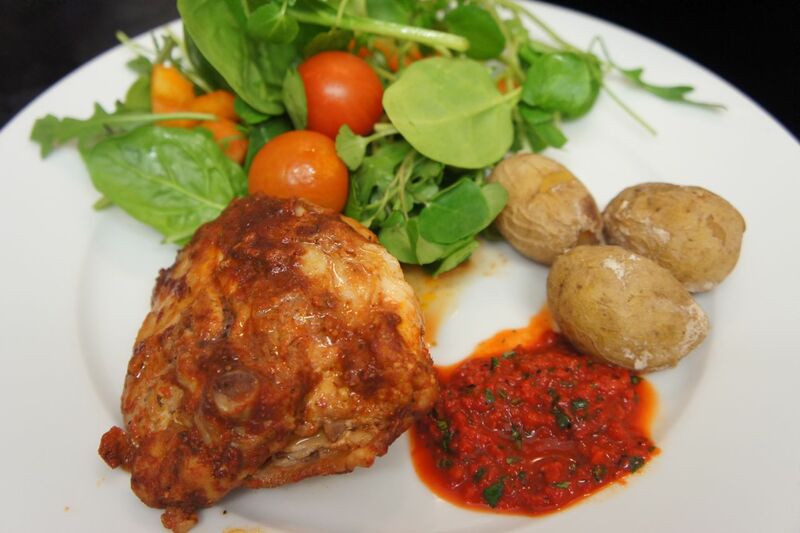 Serve hot or at room temperature with mojo (see recipe below). If you need to make this a little in advance, store with the pot uncovered. If you cover the pot, the moisture from the potatoes will condense and the potatoes will lose their salt crust. If you need to make it more than an hour or two in advance and/or it’s necessary to cover the pot, do not despair. First, take the potatoes out of the pot and brush off excess salt. Then wash the pot, as there will be excess salt crusted at the bottom. Now return the potatoes to the pot and cover. Shortly before it’s time to eat, put the pot on medium-low heat, with the lid on, so the potatoes get properly reheated. Shake the pot a few times to heat evenly. Then take off the lid and turn down the heat to low. Heat on low, shaking the pot regularly, until the moisture has evaporated and the potatoes are evenly covered with a light salt crust. Again, serve hot or at room temperature with mojo. Mostly drain the jar of roasted red peppers but leave a tablespoon or so. Roughly chop the coriander. 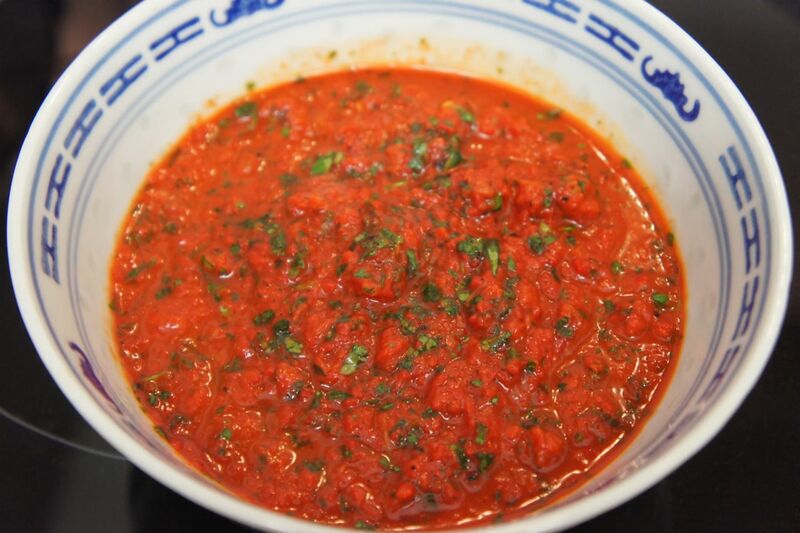 Put both main ingredients in a food processor and whir until you have a thick sauce. Add salt, lemon juice, hot paprika and/or cayenne pepper, and olive oil and give it a quick additional whir to mix. That’s it! This entry was posted in Dairy-free, European food, Grain-free, Sides, Vegan, Vegetables, Vegetarian and tagged Canarian, Canary Islands, coriander, easy, gluten-free, grain-free, kid-friendly, low-FODMAP, mojo, papas arrugadas, potatoes, recipe, red pepper, salty potatoes, sauce, sea salt, wrinkly potatoes by karenyk. Bookmark the permalink.